1988 Paris-Roubaix surprisingly won by Belgian Dirk Demol (later, he was the Directeur sportif of the UCI Pro team RadioShack). With 27 km to go, a group of unknown riders broke away. The peloton did nothing to chase them down. It was on a section of cobblestones outside Roubaix that Swiss rider Thomas Wegmuller (KAS) and Dirk Demol (AD Renting) broke away from the lead group to search for the victory. 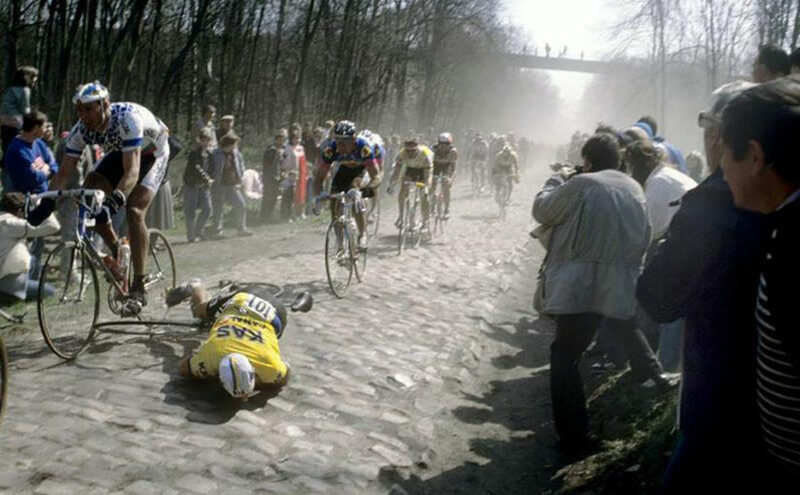 Alfred Achermann from the Spanish KAS team crashes at Paris-Roubaix 1988, in the Arenberg forest. When the two breakaway riders entered Roubaix, Wegmuller ran over a plastic bag that flew out in front of him, which became jammed in his derailleur. Wegmuller was unable to change gears which was crucial for a sprint finish. He got assistance from his team car to remove the bag, but his gears still would not change (you can watch this unfortunate scene from 33:20 in the video below). Knowing that a bicycle change would be suicidal to his chances, Wegmuller continued on his damaged bike; while Demol was drafting in his slipstream. When it came down to the final sprint, Wegmuller could only watch as Demol sprinted past him to take the victory. One of the pre-race favorites, Système U’s French rider, twice Tour de France winner Laurent Fignon finished third after a late breakaway from the chasing peloton. 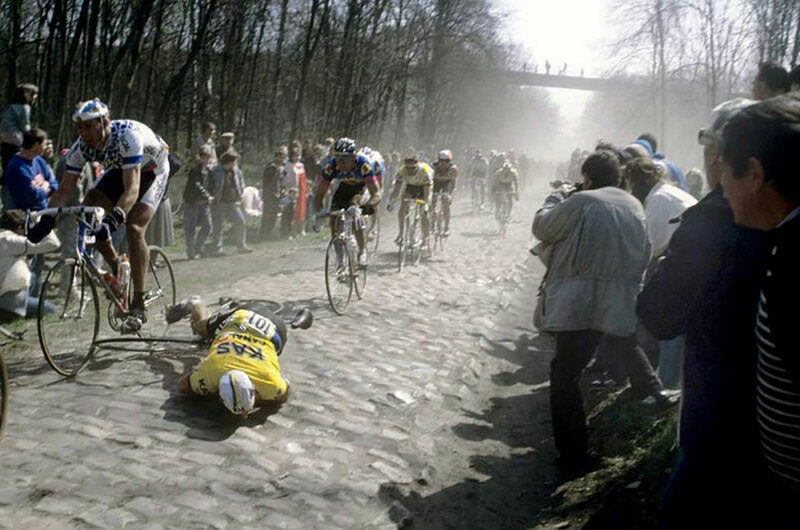 Fignon never won the Paris-Roubaix. I found the video below, one of the most entertaining 30 minute clips I’ve ever seen. It is definitely worth a watch. Commentator: Phil Liggett. Achermann’s crash is at 23:20.